Applications are now open for Fringe 2019 - Click here to login or register and apply to take part in August 2019! It is important to note we pick and choose the shows we would like to appear, or we feel would suit our venues and programme the best - so it is better to put in a good and detailed application, rather than a quick one! It is not a case of first-come, first-served - Though having your application by the end of January will get you in with the best chance of your preferred space if we like your show, as we will start to programme spaces at the start of February. You will need to register your show online via this website. 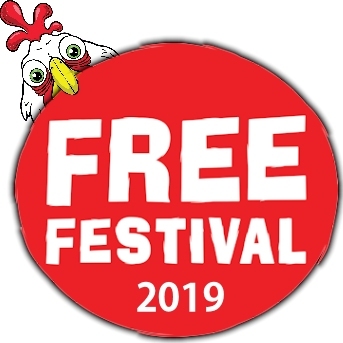 To register you need to log in to this website - If you have performed with the Free Festival previously, or with the Laughing Horse at festivals in Brighton or Adelaide, you will already have a login, and you can use the same login again. You will also already have a login if you have entered our new act competition or have done a show with Heroes of the Fringe before 2016. We will accept applications at any time before the Fringe, until our venues are full. but in order to have the best chance of the venue and timeslot that you would like, you should apply by late January. Our first slot offers will be sent out at the start of February, with more right the way through February and onwards to the Fringe programme deadlines in March and April. All applications are looked at by our programming team, and we decide which shows best fit our programming. It is false information, often put around by paid venues and competitors, that free shows are not programmed or curated, they are like any other venues shows, so it's up to you to put in a good quality application so we want to put your show in our venues. We are always over-subscribed. The Fringe programme deadline is in mid March for the cheap deadline, And early April for the final deadline. The Fringe will start taking submissions for the programme from early January. All of our shows must be entered into the Official Fringe Programme. We aim to get back to all shows that have applied to us by March 1st in time for the early deadline, if you haven't heard from us by early March do email - occasionally some applications do slip through the net, as we do get hundreds (usually over a thousand in the end) to look at. Your show application will form the basis of your programme entry with us online, in our printed programmes and listings, in our press and PR, and in what we send out to others or display in our venues. You are able to go back and edit your application and show details at any time, and once your show is confirmed with us you can add images, press & media information, and reviews and links at any time up to and during the Fringe. If you wish to present more than one show, you need to complete a separate application for each show. As an organisation we do not restrict performers in any way, and all of our performers are also able to perform with and work with any other venues or Fringe organisations. Some of our best performers have crossed over shows running with us and paid venues, other free and 'Pay what you want' venues, and we ourselves collaborate and work with other Festival organisations, promoters, and sponsors all the time to benefit the Free Festival and the Fringe in general.